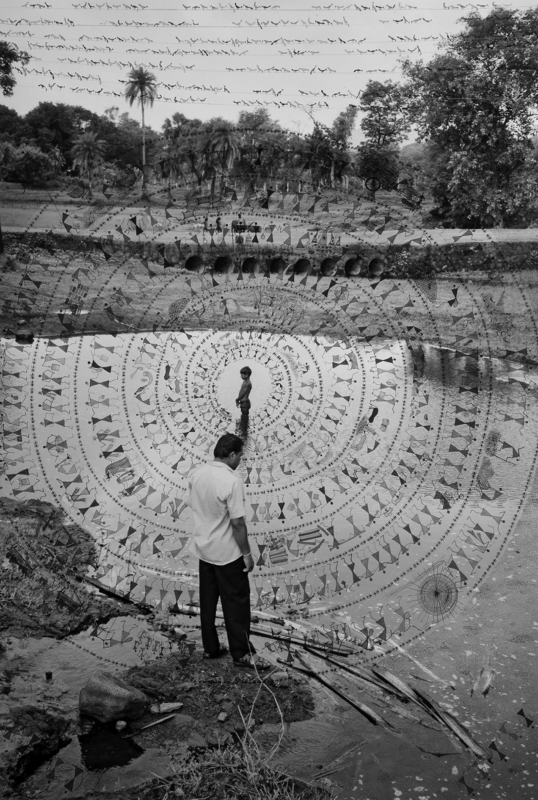 Fields of Sight (2013–), produced by the Delhi-based photographer Gauri Gill and Rajesh Vangad, a self-described tribal artist trained in the Warli artistic tradition of Western Maharashtra, breaks new ground as a photographic history of embodied experience. Comprising forty works and subject to further additions, this series features Vangad’s paintings of his experiences of his hometown of Ganjad overlaying Gill’s photo-journey of the rural township. In this essay, I argue that the series capitalizes on the distinct ontologies of Warli and landscape photographic traditions and their performances in the contemporary imagination, to construct alternative architectures of memory. I draw from the recent ‘spatial turn’ in visual cultural studies, which links the intellection of space (both physical and photographic) to the formation of personal, cultural, and body memory, to analyze how the artists redraw conventional lines between the photographic past and the present. In a photograph, I see a man’s back, Rajesh Vangad, a self-described tribal artist of the Warli tradition of Western Maharashtra and creator of the overpainted tableau. He sits astride his motorcycle not far from an embankment, past which a silver stream cuts a path through a landscape energized by the teeming presence of figures carrying on with their daily activities – farming, playing, and milling about. Travelers crossing the silver stream support their luggage with arms upraised, and a motorcyclist and rider power their way up the picture field and the countryside, gesturing to a range of spatial trajectories and dimensionalities that pierce the flatness of the filmic surface. 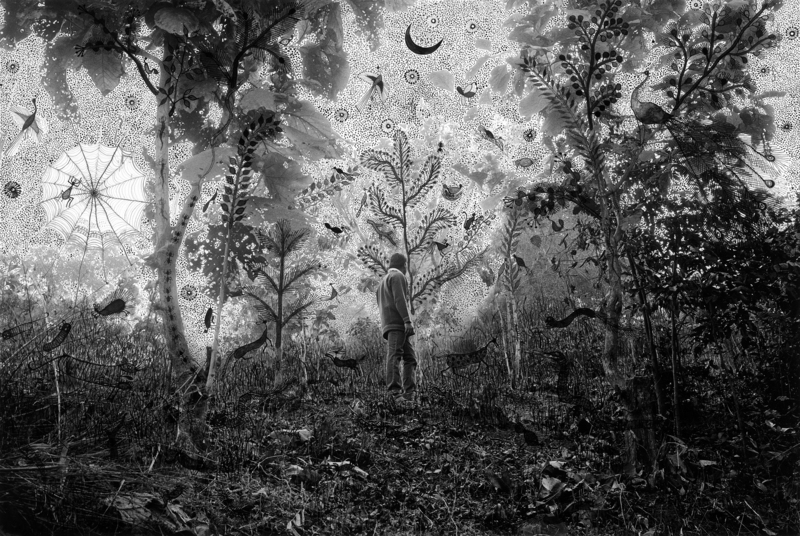 This is part of a larger series of conceptual and artistic collaborations between the photographer Gauri Gill and Vangad, entitled Fields of Sight, begun in 2013.1 With this paper, I look at their unusual collision of physical and psychic topographies, achieved through the layering of black ink drawing over black and white photography. Combining two visual media with distinct histories, ontologies, and discursive frameworks, Fields of Sight breaks ground as a new history of embodied landscape. Begun in 2013, Fields of Sight emerged organically from sustained interactions between the two artists. Vangad’s family hosted Gill in his native village of Ganjad in Western Maharashtra, India, while she worked locally on another photographic project. During Gill’s stay, Vangad took his guest around the places he had grown up, ambling about the environs, fields, factory sites, and lakes of Ganjad. Experiencing a memory tour of sorts, Gill took up the camera to photograph Vangad’s home and objects of reminiscence. Gill explained to me that her photographs of the tour struck her as incomplete, missing Vangad’s experience of space. Acknowledging and seeking to visualize their discrete experiences of space, Vangad and Gill embarked upon Fields of Sight, featuring Vangad’s drawings on Gill’s photographs. Mining experiential fracture as the productive space of co-creation, the works regularly feature Vangad in the landscapes, inhabiting a photographic and drawn universe of forms and space. This project was initially comprised of twenty pictures, which were exhibited at the Kolkata-based Experimenter gallery in 2014. It has grown since, now at 40 photographic paintings. According to Gill, this project may yet see further additions, forming an elastic and open-ended project. This is not Gill’s first venture into collaborative practice. In her series Balika Mela (2003/2010) Gill set up a make-shift booth at a local fair for teen girls, where portrait sitters were invited to coordinate their presentation, choosing their accompanying props, backgrounds, and positioning. These portraits are marked by the agency of the young women in their self-presentation. Even her project entitled 1984, released in 2013, a combination of photographic prints by Gill, excerpts from newspaper articles addressing the anti-Sikh pogrom of 1984, and responses to the pogrom and its media coverage provided by contemporary artists, provides a multi-perspective explanatory framework. As a descriptor, Fields is an index of three things – the physical places viewed by Gill and Vangad, their distinct psychic experiences of space, and their distinct representational practices. It is an acknowledgement of the variability of Gill and Vangad’s experiences and arts – a poetic exploration of cognition, perception, and representation. Consequently, formal readings of the works flatten the conceptual complexity of Fields of Sight, incapable of providing explanatory frameworks for art works that are both transcriptions of space and embodied experience. The problems with discussing such a collaboration are multi-fold. 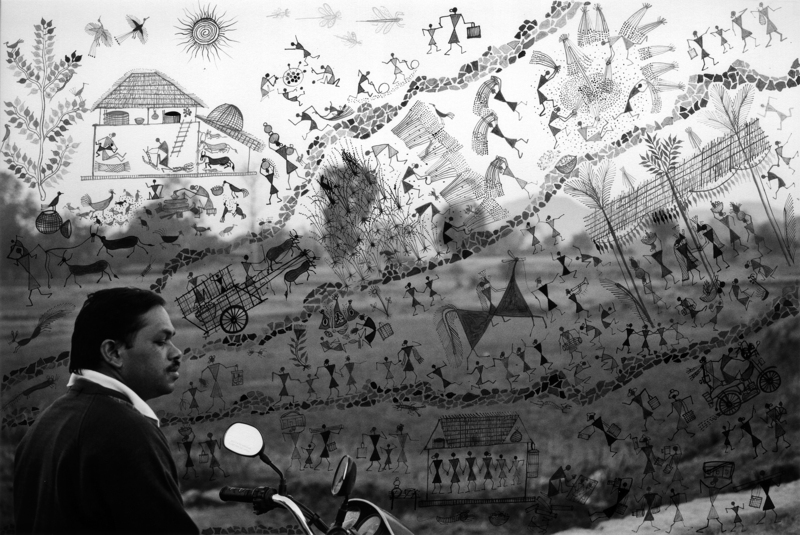 Iconographic analyses of the landscape and over-drawings tends to locate the media in two distinct traditions, pulling Vangad’s drawings into conversation with Warli artistic precedent and away from Gill’s photographed landscapes. Gill’s photographs, functionally the support for Vangad’s work, are inextricable from the web of drawn images that cover their surfaces. 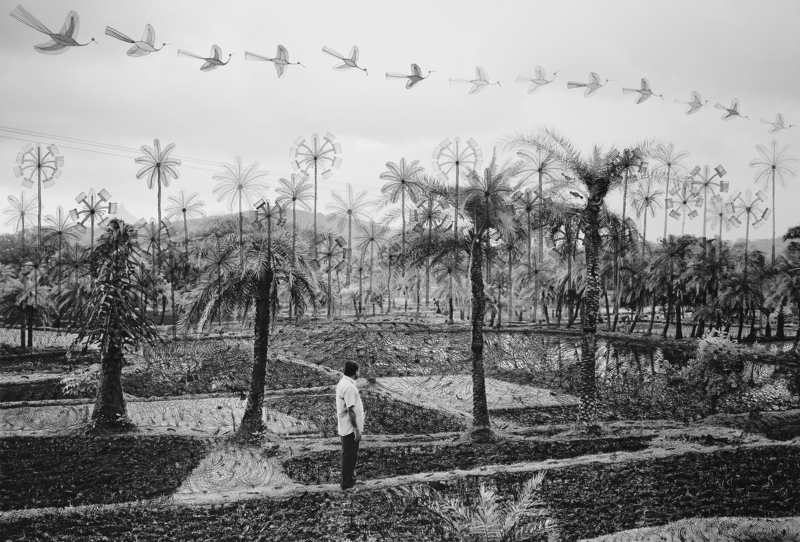 Placing the two mediums within a unified iconographic analysis obscures the artists’ different interventions, and fixes the oscillating meanings of the photographs – the plurality of fields – with one meaning. ‘‘Moonlight in the Forest,’’ an overpainted photograph featured in the project demonstrates the productive challenge of entering into Fields of Sight through discrete readings of Vangad and Gill’s forms, concepts, or iconographies. Furthermore, its composition foregrounds the conceptual layering of Fields of Sight – the complicity of Gill, Vangad, as well as the photographic viewer in generating meaning. Vangad stands in the mid-ground of the picture field, with his head turned away from the camera. The profusion of vegetal imagery imaginatively suggests Vangad’s focus on depths of forest inaccessible to the photograph’s viewer. The life drawn into and onto the landscape weaves an organic net over the photographic surface – organic both because of its subject matter and its hand-drawn style (which might be considered ‘organic’ at least compared to the camera’s technological language). The teeming veneer and the crescent drawn into the upper picture field solicit the viewer’s eye to view the metallic day sky of the print as the silver incandescence of moonlight. Similarly, in "Night Journey of Forest Dwellers" the artists deny the possibility of a singular reading through strategic renderings of space. 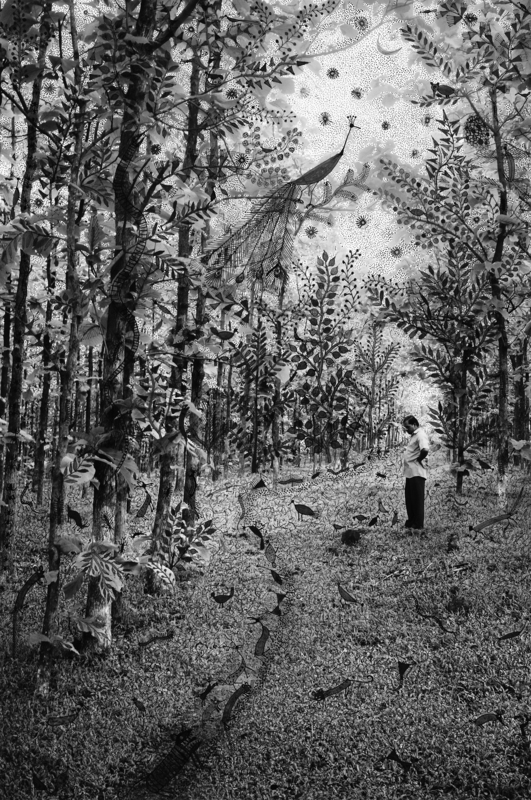 The omnipresence of the forest dwellers, whose black outlines ground them within the pictured black and white landscape, suffuses the photograph with Vangad’s memory of land – creating an atmosphere of Vangad’s generation. His slight hunch takes on a proprietary attitude among the creatures, which both kindles my self-identification and its converse, my voyeuristic distance. As he looks down, I look down at the things that make themselves known to him (and to me), and the surreptitious creatures that are realized on the photographic form. Gill’s framings, which are vast and infrequently draw attention to the foreground, further open the immersive capacity of the works. In ‘‘Harvest II’’ and ‘‘River’’ among other works, her frames allow the viewer to move into their not-as-yet-visible depths in an imaginative resistance of rational time and photographic space. 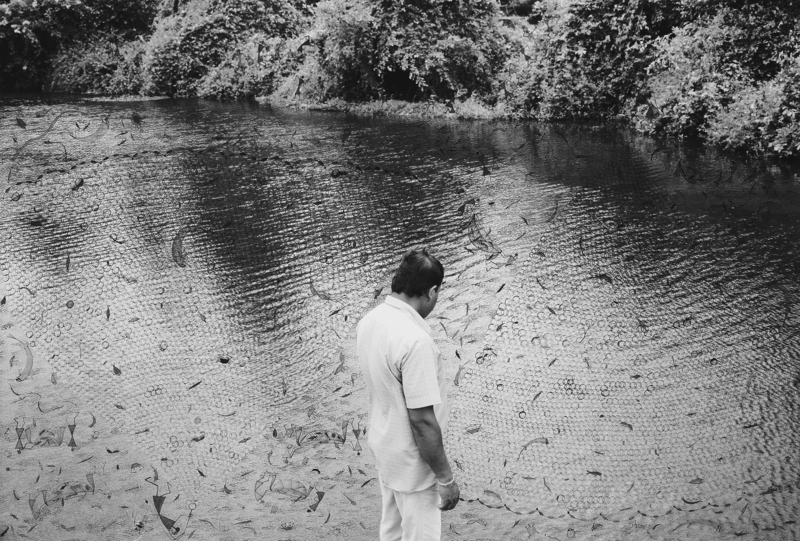 Challenging the conventionality of rural landscape-documentary photographs, a genre with rich colonial roots and touristic resonance, Gill’s engagement with land is intimate, unexpected, and determined by Vangad’s selection of spaces to memorialize. Defying the ‘non-style’ of the snapshot aesthetic, Gill and Vangad foreground aestheticism as a documentary proposition. They redirect the orientation of the artwork from the picturing of land to the experience of space. 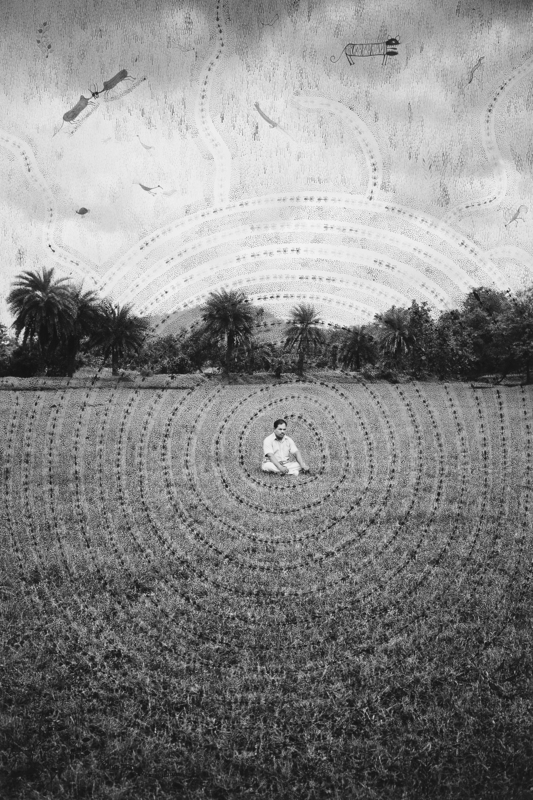 Through the depiction of sweeping receding fields within which Vangad is most often featured alone, Gill foregrounds the silence of the photograph, training a view on the ‘nearness’ of his lived experience, while still instantiating the insurmountable distance of representation. Imagine the road as a pathway that draws your eyes and sense of the scope of the land deep into the photograph, into an infinitely receding village that exists beneath the metropolis. The drawn forms sheathe the surface of the photograph, forming a vertical counterpoint to the patently horizontal arc of the road. The photograph and the drawings form planes that intersect at the horizon, constructing a dimensionality and palpability – an architecture of memory constructed from distinct spatial practices and materialities. Whereas Warli art has historically sheathed architectural forms, requiring the viewer to shift her body and the angles of her gaze to accommodate the unfolding forms, the photograph is intelligible within one glance, encouraging its viewers to stand fixed and gaze into it.7 The artists use these historical differences to advantage; playing with alternative and even contrasting rationalizations of space, the artists’ collaboration constructs a new architecture of memory. In ‘To the City’ the foreshortened length of a roadway emerges from and forms the base of the photographic field, tapering in the center, arterially linking the village and the city. 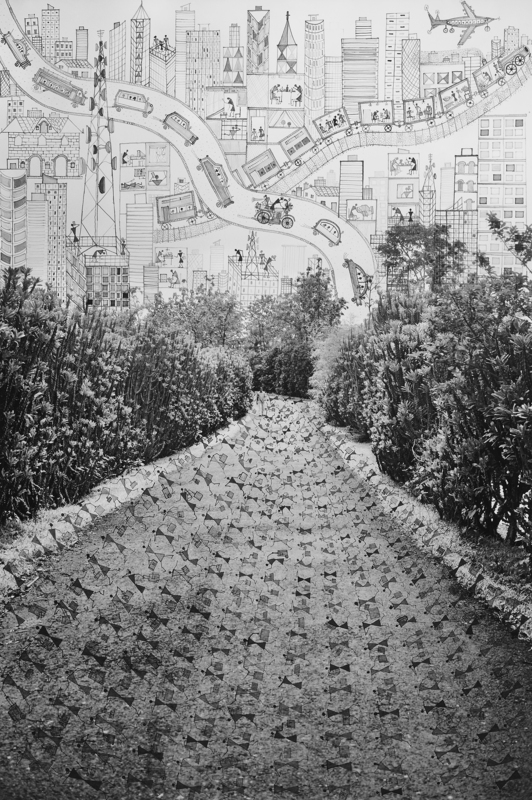 Carrying processions of migrants netted in rows, the pathway invites the viewer’s eyes to the horizon line, where roadways thick with traffic cut intersecting paths across a similarly bustling sky. The work is rendered in multiple perspectives; the photographed road is frontal and roughly at eye level, perpendicularly intersecting with aerial views of urban highways and largely frontal views of high-rises. The climb of the urbanized sky is vertiginous against the concave pull of the roadway. The perspectives offset time, rendering it sticky, slow and thick. While the repetition of migrant bodies and their unceasing presence might normally suggest their perpetual movement, their entombment within the roadway traps them within a singular stillness. The presence of the urban scape looming within a blank sky simultaneously suggests a vision of a future city and a city that is perpetually coming into being. Bearing the bodies of hundreds of hourglass figures similarly rendered, luggage in hand, temporality is further disturbed. The processional aspect of their depiction rejects temporal specificity; this has taken place, is still taking place, and is perhaps perennially taking place as a portrait of emigration. Mundane temporality is denied in favor of what seems to be a heavier acknowledgement of the fundamental rupture in Ganjad time, caused by the urban migration that is now typical of rural India, as the nation becomes an increasingly industrial and service economy. If the photograph is a deterritorialized rendering of space, then Fields of Sight is the resituating of land to the fields of personal and social memory.10 If the landscape as a photographic genre is the modern rationalization of foreign space, then Vangad’s photographic presence, Gill and Vangad’s competing perspectives, and their compositional collaborations assert a different kind of modern, one that is intimate, opaque, experiential, and uncertain. Rashmi Meenakshi Viswanathan is a Postdoctoral Fellow in Global Contemporary Art at the New School University who writes on colonial-era art and its historiographies, and more recent art in and related to the Contemporary. She is also currently a curator in residence at Residency Unlimited, Brooklyn, and Alwan for the Arts . 1 Gauri Gill’s photography was the subject of the Smithsonian Institution’s exhibition, Notes from the Desert: Photographs by Gauri Gill, 2016-17, and more recently was on view at Documenta 14, in Athens and Kassel, 2017. She and Rajesh Vangad visited Kassel together, where Fields of Sight was on view; the series is currently on display at the Moscow Biennale, Moscow and will show at Prospect in New Orleans. 6 Gilles Deleuze and Félix Guattari’s construction of ‘smooth space,’ a nomadic space of knowledge and experience that runs counter to those of the state (constituting the ‘striated space’), profitably describes the poetic topologies of Fields of Sight. They ascribe to the latter extensivity, or observable properties that are divisible, such as height and weight, and to the former, intensivity, deep properties that cannot be halved nor changed without altering the constitution of a thing. In so doing, the authors provide an opposition between the regimentation (‘striated space’) of the vision of the camera, with its unidirectional gaze and illusions of fore-, mid-, and backgrounds, and the ‘smooth space’ of the immersive depth and the multiple gazes from within and without, of the overpainted photographs.